Francoeur Law Office is leading the way to critical changes being made in the application of labeling laws. See the recent article in Snack Safely in which Attorney Francoeur talks about our fight to ensure that food labels accurately, and in plain English, list any allergens in the product. Thanks to Snack Safely for recognizing the importance of this case to the food allergy community. 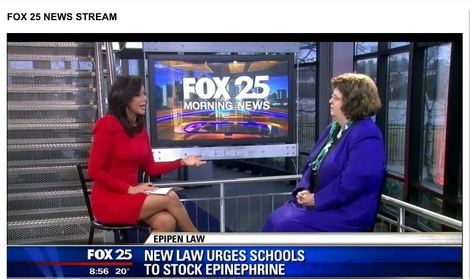 Laurel was interviewed by WWLP on keeping kids with food allergies safe in school. Laurel testified before the Connecticut General Assembly on 504 accommodations in schools. Click here to read her presentation. Daycare Allergy Rights Case: Where Does it Leave Us? Does your restaurant know what to do if you have a peanut allergy? Inspiring Food Allergy Bloggers and Authors.